WOBURN, Mass. – In March's biggest moments, the star players shine the brightest. No . 5 Brighton senior Tyrone Perry had a game for the ages Saturday night in the Division 2 North final against No. 3 Lynn Classical, scoring 23 out of his 30 points in the second half to lead the Bengals' comeback win over the Rams, 79-73. Brighton (21-5) will play Division 2 south champion Whitman-Hanson Monday at the TD Garden in the state semifinals at 7:30pm. The 6-foot-3 Perry single-handily helped to bring his team back from the brink of defeat. But for most of the night, it was the young Lynn Classical (21-4) team who dictated the pace of the game. The Rams played an exciting style of basketball. The Bengals would have a player sneak out to half court as an opposing shot went up, and the rebounder down low would find them in transition. Classical sophomores Jaylen Johnson (20 points) and Dyrrell Rucker (8 points) were two of the prime receivers in this style of offense in the first half helping the Rams get out to a 40-34 halftime advantage. Throughout the third quarter, Classical continued to push the pace and some costly mental turnovers by Brighton helped them do so. A three-pointer from junior Edwin Solis (13 points) and a midrange jumper by junior Melvin Nieves had them out to a 52-45 lead late in the third quarter. But this is when Perry began to shine the brightest. He drilled a deep three-pointer at the buzzer to help cut the deficit to five, and he didn't stop there. With six minutes to play, Perry hit a contested corner three-pointer that tied the game at 56. Less than a minute later, Brighton senior Willie Veal connected on his fourth three-pointer of the night that gave the Bengals their first lead since the second quarter. Lynn Classical snatched the lead right back three minutes later as one of the few seniors on the Rams team, Gilbert Minaya, converted a layup along with a free throw from the foul making it 65-64. The lead was short lived though as Perry came down the court and with a look of determination in his eyes, drilled home a three-pointer from the top of the key. 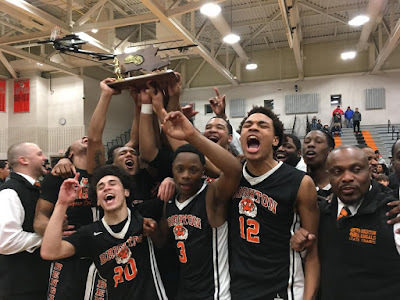 Brighton increased its advantage when junior Quincy Taylor came away with an offensive rebound and placed it in off the glass the next possession, and an emphatic one-handed slam with 1:38 left from Perry put a perfectly knotted bow on his extraordinary 30 point, 10 rebound night. The Rams got within three with 23 seconds left as Solis hit a transition three, but Brighton finished off the game from the free throw line to win.